Like humans, cats can have naturally occurring skin problems. 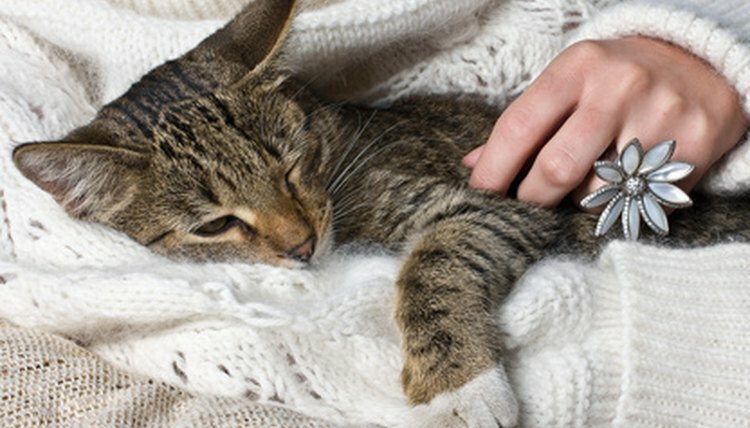 Dry, itchy skin and allergic reactions are among the skin conditions that can affect cats. Remember to see your veterinarian before implementing any course of treatment, as these could be signs of illness as well. According to the Cat Health Guide, there are some herbs that are safe for cats and beneficial for dry skin. These include horsetail, dandelion, spirulina and kalium sulphate. A carefully blended bath salt mixture made of these can help relieve dry and itchy skin. If your cat has dry skin you should not bathe it unless absolutely necessary. Licorice root is another herb that is soothing to a cat's skin. It is most effective on itching due to allergies. The same anti-inflammatory properties also make it effective against arthritis. Other benefits include soothing the mucus membranes and cleansing the blood. It also tastes good to cats. A bath in peppermint and rosemary oil can act as a natural insect repellent and boost the effectiveness of your cat's flea control. They also have skin-soothing properties.